How do you make an appointment fit into your hectic life? What time to I need to be there? Where do I need to be afterwards and by what time? These thoughts have to be considered before we start trying to book an appointment. It doesn’t matter if it’s a physiotherapist, hairdresser, beauty treatment or even a table at a restaurant. And on and on… it’s like a dance that has been going on forever. We all have our favourite people. We use the same physio because they ease the pain, the same hairdresser because they make us look great, and the same restaurant because the food and atmosphere are great… but booking them is such a pain in the behind. We want to use local people, and we know people who have their businesses, but it has to be easier to know when they are free. We want to fit them into our schedules without all the hassle. And at the same time, they don’t want ring 20+ people on a waiting list when someone else cancels an appointment or table. 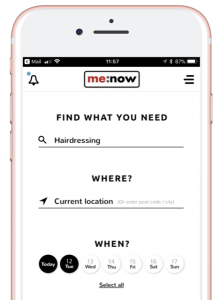 Tell the people that you use, or the friends you know with their own businesses, about the me:now app. Using it, they get to advertise when they’re available and their customers (you) can get a mobile alert whenever they do (you can turn off the notifications when you don’t need to see them anymore). You get to know first when that last minute cancellation comes in and when you recommend them to your friends you can share when they have a slot free. It means way less hassle for us because we know if our favourite businesses fit with our schedule, and they stay in business because they don’t have to spend ages trying to fill empty appointments. When they register their business they can use this code FBCUS01 for 3 free months on our premium tier. It’s like your gift to them for helping you out.